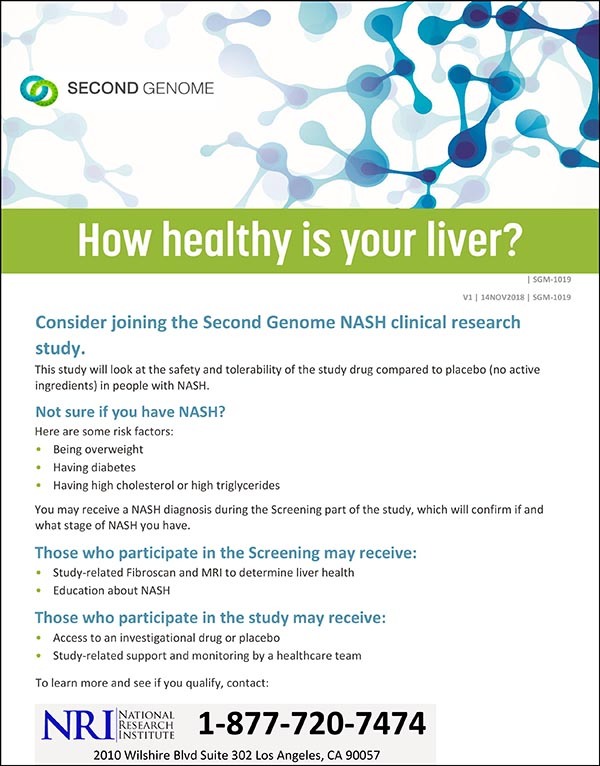 Consider joining the Second Genome NASH clinical research study. This study will look at the safety and tolerability of the study drug compared to placebo (no active ingredients) in people with NASH. Are you suffering from a Fatty Liver? Ask us about your liver. Have you ever been told you have or are at risk for fat deposited in your liver? Have you had abnormal lab tests? Have you ever told you are at risk for or have diabetes? Do you have a family history of liver disease related to fatty liver? This study will use an imagoing technique called LiverMultiscan to see if HTD1801 helps to treat NASH. HighTIDE Biopharma Pty. Ltd (Hightide) is the sponsor of this study. NASH is an advanced form of fatty liver disease called non-alcoholic steato-hepatitis. If you have NASH you may be able to participate in this research study. If you qualify, your participation will last up to 6 years with up to 8 office visits in the first year and a half and 2 office visits every year following. Study drug, study-related and all study tests will be provided at no charge. Eligible participants may also be reimbursed for travel expenses.